We’re excited to announce that for the first time we’ll be featuring 15 (mostly) local artists and artisans whose creations take inspiration from death, handpicked by Death Salon HQ. 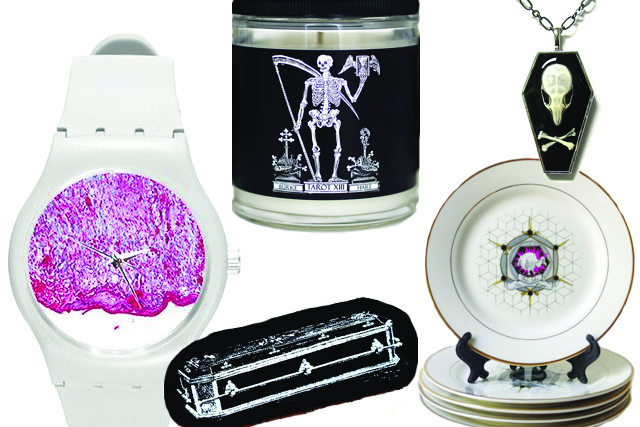 We’re calling it the Death Salon Dark Artisans’ Bazaar, and the marketplace will be open exclusively for Death Salon: Mütter Museum attendees during session breaks. We are considering packing extra suitcases to accommodate all of our scores from Dark Artisans’ Bazaar. Blood Milk – Jewels imbued with personal tales, historical contexts such as the Victorian Spiritualist movement and mythological references, mostly all of which surround the dark romanticism that the question of death often carries with it. Courtney Brooke – Photographic prints inspired by photographic history, wooded ritual, and feminine spirituality and power. Susan Crawford – Original Block Prints, Digital Prints, Custom Bags and Pillows. Death Midwifery USA – Practical advice for planning home funerals. Death Under Glass – Death investigation at high magnification: umbrellas, bags, watches, business card holders, and much more created from microscopic images of human tissue. 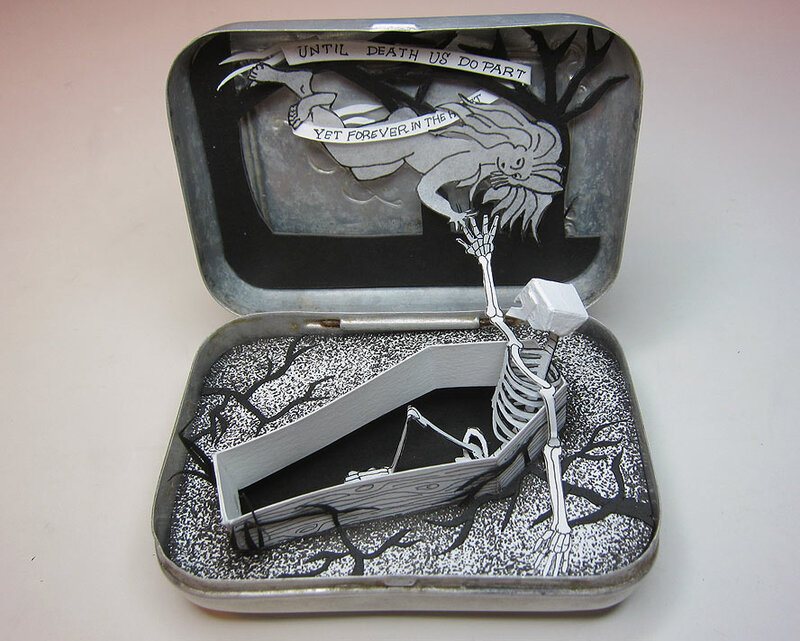 Jim Doran – Order of the Good Death member Jim Doran makes tiny paper cut dioramas showing macabre scenes in unlikely containers – discarded fish tins, old toys, make-up containers, spoons. Elemental Child – Handmade crystal crowns, inspired by science fiction, fantasy, magic, and 70’s rock and roll. Funeral Consumer Alliance of Greater Philadelphia – A volunteer-run, not-for-profit organization providing the tools to empower people to make informed advance decisions about funeral and memorial arrangements. The Last Menagerie – Marking the 100th anniversary of the disappearance of the passenger pigeon, this line of plates commemorates extinct animals. Caitlin McCormack – Crocheted skeletal specimens by Caitlin McCormack, previewing her my solo exhibit at Paradigm Gallery + Studio, which opens October 23rd. All works appear courtesy of Paradigm Gallery. 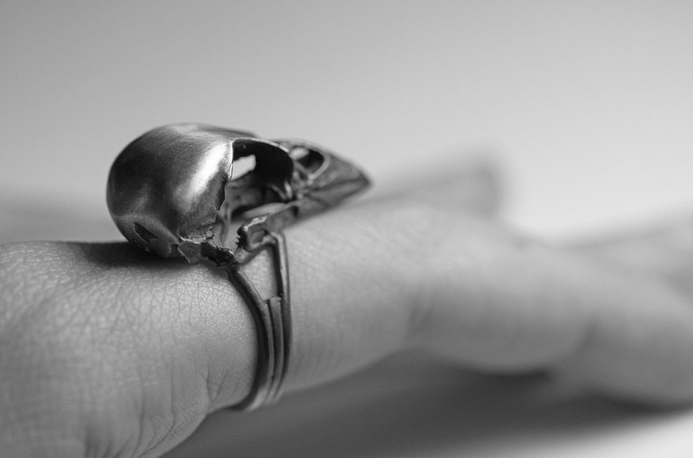 Mechanique Macabre – Finely handcrafted jewelry pieces made from bugs, bones, and peculiar artifacts. All specimens used are cruelty free, and have not been harmed by the human hand. Obscura Antiques – Selections from New York’s Obscura Antiques of TV’s Oddities fame. Osteographica – A line of t-shirts, cards, and note pads inspired by the Mütter Museum. Each fabric item is hand crafted, unique, and inspired by the unique beauty and aesthetic of the museum’s collections. Mark Splatter – No More Heroes is a line of shirts providing memorial for a series of artists, inspirational and motivational to our studio; likenesses of icons and iconoclasts who have been my heroes and mentors – part reverence, part remembrance. Damage Patches are the first line of products from the Creepy Rock & Roll label, all screen printed and sewed by hand. Tear Drop Memories – Pennsylvania antique store dealing in Victorian medical and funeral objects, as well as a large collection of antique post-mortem photography. Urns by Artists – An independent specialty gallery for cremation urns created by artists from around the world.